Why I Buy my Bikes Used (and Why You Should Too). So I know that I said that I was going to talk local next. I like to keep my word, but I this is an interesting topic that I have been thinking about and I thought I would share my insights. It also ties nicely into some stuff that has yet to come. I promise I will talk local soon. The last time I had a brand-new bike was sometime in my teens. For Christmas, I was surprised with a Mountain Tek Boulder. It was a Mountain Bike, 26″ wheels, aluminum rims, nice and shiny red. It is funny because that bike was in my life at a time when I honestly cannot remember much more than that. It was a great bike and I rode it all over. Then one weekend my aunt and uncle has a garage sale. My trusty Mountain Tek had recently somehow stripped threads on the crankset, making me replace it. I was baffled how silly the whole thing was. I went to a pre-garage sale and found my uncle selling his Raleigh Technium Mountain Bike for $50. It fit, it wasn’t my Mountain Tek (the local used bike shop was willing to buy it from me for $40), and best of all, It was the exact same bike that my dad owned. As a 15 year old, I was absolutely stoked to have the same bike as my bike warrior of a dad. Not three hours after I had acquired my new Raleigh, my dad convinced me to sell it to him for $20 plus his Raleigh, as his had definitely seen some miles. Eager to make a quick $20 at the age of 14, I went ahead and made the deal. Why do I tell you this story? How does this tie into me advocating for buying used bikes? Well, I received the Mountain Tek new. MSRP on a 1996 Mountain Tek Boulder is $249-that is to say, it was a fairly entry level bike. The Technium, safe to say, retailed for quite a bit more than that-it was defintely a late 80’s mid-range bike. In 2007, I finally sold it to a gentleman in Bellingham who had every intention of riding it longer. Below, is a list of points why buying a used bike might make sense for you. Bike technology is not as rapidly evolving of an industry as they want us to believe. The bikes made 20 years ago have very few technological differences from the ones sold new today. As long at the frame fits your needs, any of the other parts can be changed out anyway. 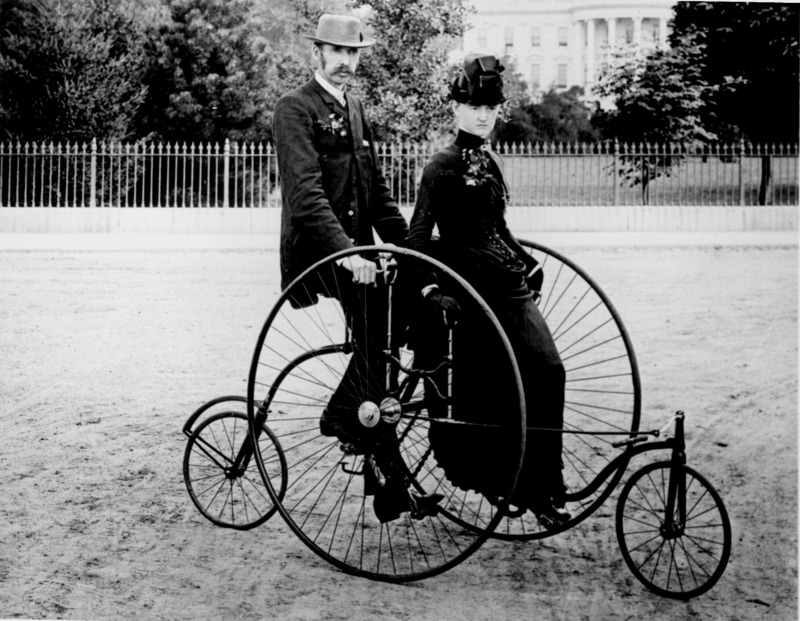 Jenica and I trying out our new Tandem! 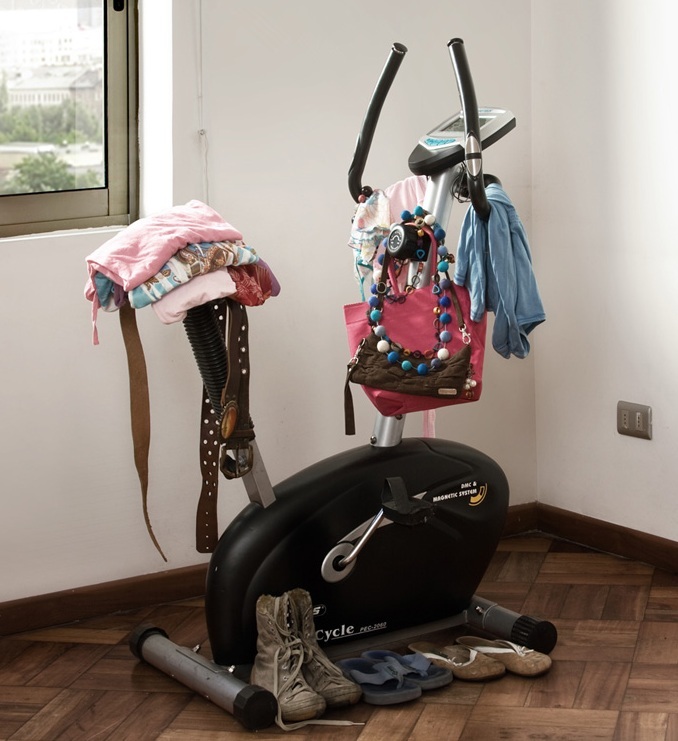 Bikes can still be classified as fitness equipment. I think everyone has, or knows someone guilty of buying a treadmill around New Years only to use it for a few months and then have it sit in the basement before being sold at a garage sale or craigslist for maybe 10% of what was paid for it. Bikes are very much, for the average person, fitness equipment. It is not hard to stumble across lightly used bikes that people are happy to see go, and the prices reflect that. Get so much more for your money! My story should illustrate this well. Sure it was nice to have something shiny and new, but a few months of riding in the rain do you think it really made much of a difference? Stopping in at bike shops and looking at the latest and greatest (and how much they want for it) can be quite fun. It is astounding how much buying a new bike costs these days. Customization! Buying new also assumes that you want to buy exactly what is for sale. Parts evolve and so do frames. Do you think that top of the line race bike built in the 70’s or 80’s is that much heavier or poorly built that that mid to low range bike you bought fresh off the bike showroom floor? Maybe you don’t like the ride feel of steel, aluminum, titanium, or carbon? So don’t ride it. I was surprised to find that many of the entry level road bikes sold today are almost all aluminum. I personally prefer steel to aluminum so rather than pay a premium for modern steel, why not get something with some character and a little age? Here is a personal favorite of mine. 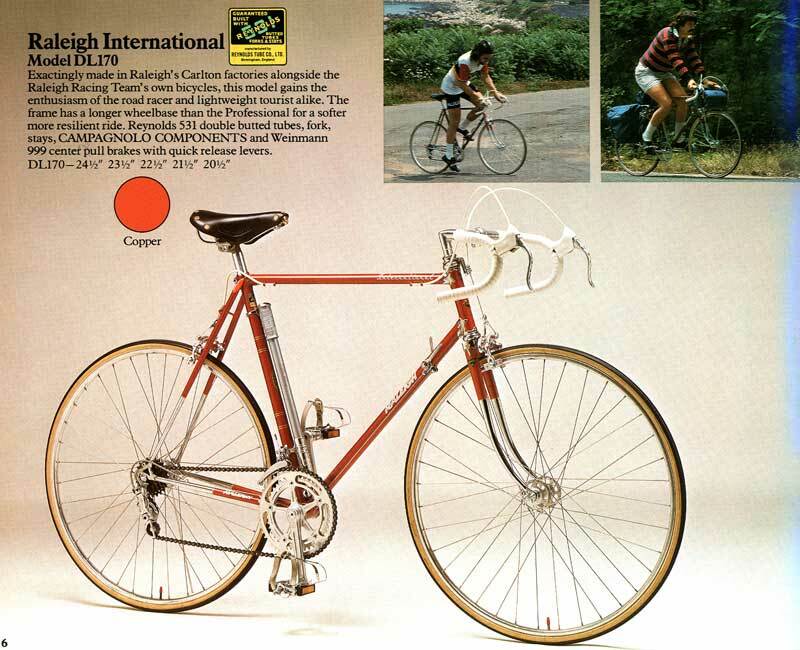 The Raleigh International is a wonderful touring bike made in the late 60’s all the way up until the late 1970’s. 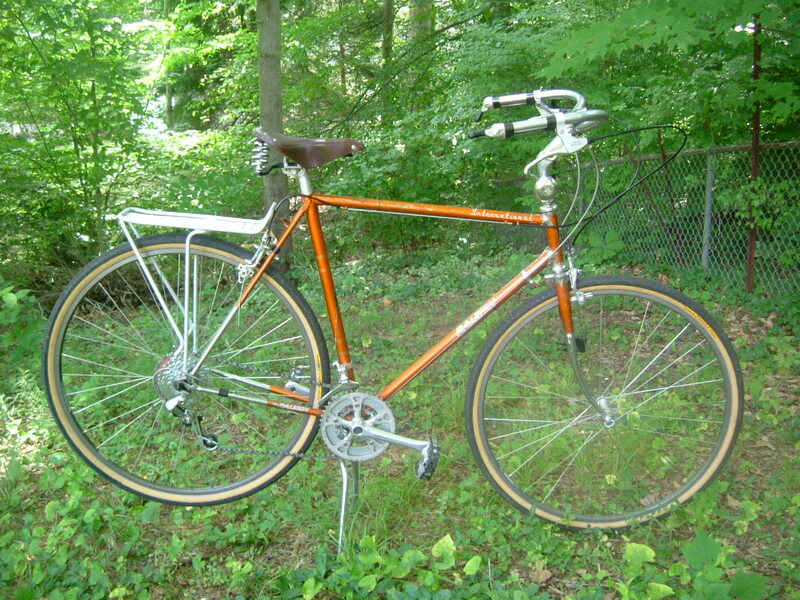 I find the ride quality and geometry of this bike to be wonderful (I own a 1974). On the left is the original bike out of the catalog. One the right is a customization that I found on another blog (https://veloapocalypse.wordpress.com). 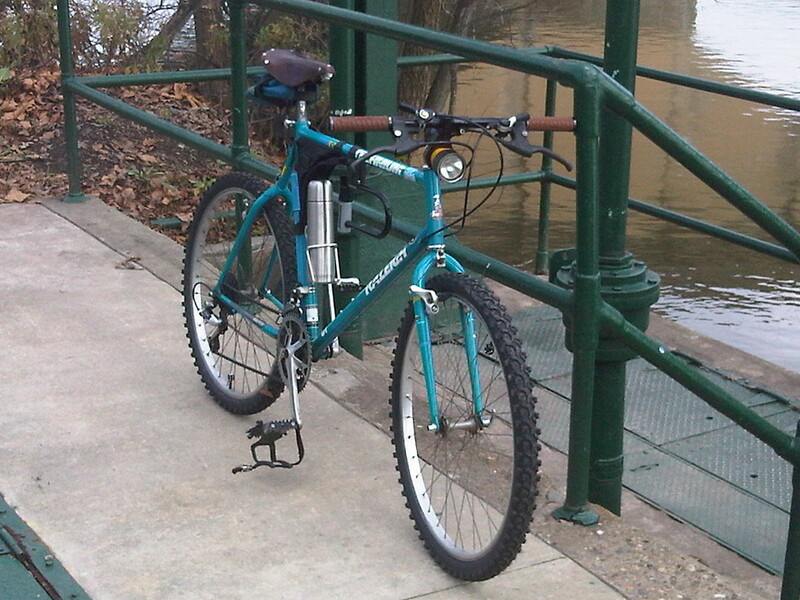 Looks like the parts were modernized, and a more relaxed ride was created with more upright handlebars and stem. Bar-end shifters replace the down tube shifters the bike was originally equipped with. After writing all of this out I concede that it can all be daunting for someone that is looking to get a bike for the first time. There is so much to choose from and short of spending lots of time testing everything, it is hard to know what to do. Take heart! There are many resources out there that can answer these questions, myself included! What is the biggest hurdle to you buying a bike (assuming you are thinking about it)? What are any concerns you have about buying a used bike vs. a new bike?